Here is How to toggle Windows 8 start menu without rebooting Computer. 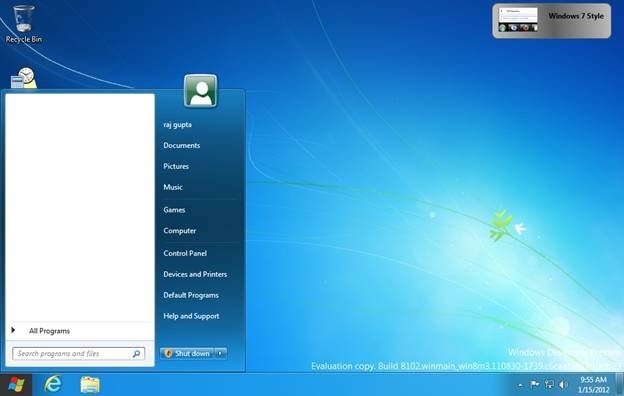 Now you can toggle between Windows 7 start menu and Windows 8 start menu by using a small Windows gadget which is named as “Windows 8 Start Menu”. 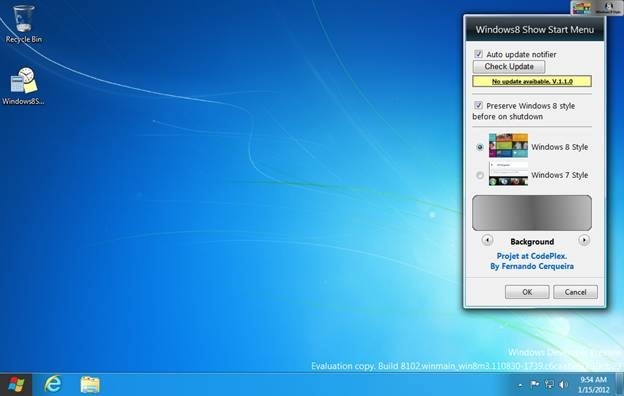 This gadget provides you the ability to switch between Windows 7 and Windows 8 start menus and the best part is – You are not required to reboot your computer during this process. This gadget to toggle Windows 8 start menu is quite handy and is very useful if you don’t like the metro UI interface and you want to stick to the Windows 7 style start menu. You can download this gadget from here. Click the download button, select the check box to agree with the terms and conditions, thereby proceeding with the download process. Click the “I agree” button. After the download is complete, you will get a “Windows8 ShowStartMenu” file which is a Windows 8 gadget file. Double click the file to install the gadget in your computer. Once the gadget is installed, you will see it at the top right corner of your screen. The icon on the gadget acts as a toggle i.e. when you click it once you will see Windows 7 style start menu. If you click it once again, you will see metro style start menu and so on. Also, read our post on Use your eyes to Control Windows 8. When you click on the “options” icon of the gadget, options box will open up where you can enable/disable “auto update notifier” and “preserve Windows 8 style before shutdown”. You can also change the background color of gadget.